The Galaxy Tab 8.9 is one amazing tablet. It is great for those who find the Galaxy Tab P1000 too small and the 10.1 one too big for their liking. We had a chance to play around with its keyboard dock and to be honest, it looks like Samsung took the keyboard of the Galaxy Tab 10.1 and swapped it with a docking station for 8.9 one. What does that means? Read the full review to find out. 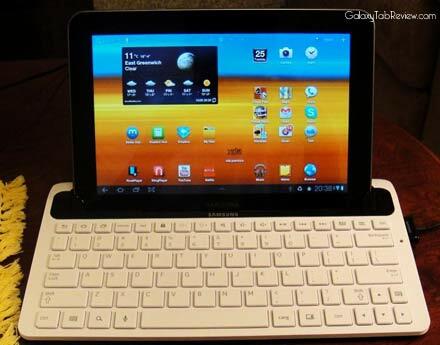 The chief problem is that the keyboard is wider than the 8.9 Galaxy Tab, which makes the overall setup look a bit weird. 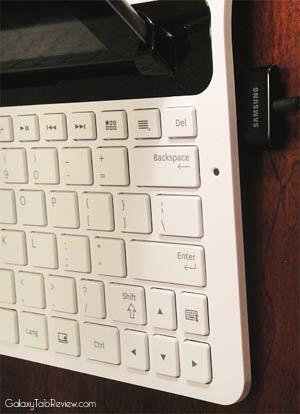 That said, the extra width allowed the Samsung to squeeze in roomy buttons, almost at par with what you get on normal notebooks. Read our Samsung Galaxy Tab 8.9 review. This makes the tablet perfect for use with apps like documents to go which allow you to be productive while on the move. Oh, and since the keyboard does not uses any batteries, you do not have to worry about the battery dying. The Galaxy Tab fits snugly and the overall setup does not wobbles at all too. You will have to shell out 80 dollars to get one for yours.